Finally! A chocolate chip recipe that you can bake with! I’ve been making homemade coconut oil chocolates for many years, and while they’re great for adding to ice cream or just eating straight out of the jar, they are NOT a good fit for baking. Coconut oil melts at room temperature, so coconut oil chocolates in baked goods just make a melty, oily mess. These chocolate chips, on the other hand, are made with cocoa butter, which handles oven temperatures just fine. It took me many years to finally work up the courage to make my own homemade cocoa butter chocolate chips. I now wish I hadn’t waited so long; it turns out that they’re actually quite simple. And I love that I can now make any recipes that call for chocolate chips! Why Would You Want to Make Your Own Chocolate Chips? Chocolate chips might seem an odd thing to make from scratch. In our family, though, if I want to bake with chocolate chips I have to make them myself. Jesse strongly reacts to all forms of sugar except honey and I’ve yet to come across commercial chocolate chips that are sweetened with honey. 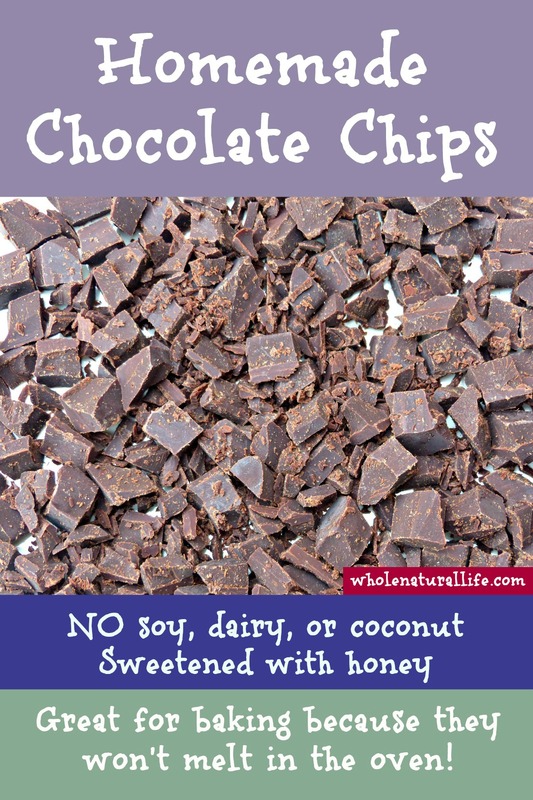 You might also consider making your own chocolate chips if you’re on the GAPS diet, or if you’re trying to avoid white sugar or other refined sweeteners. Most commercial chocolate chips also contain soy, which is a problem for many people. I learned how to make chocolate chips from this recipe from Our Nourishing Roots. If you’ve never made chocolate chips before, I’d encourage you to go read her tutorial; she has some good tips on how to keep your chocolate from seizing. After I made her recipe a few times I made a few modifications to simplify the method and make it more to our taste. I think these homemade chocolate chips are a little more temperature sensitive than commercial chocolate chips. Once I added the tapioca starch, though, I haven’t had trouble with them melting when I’ve used them in baked goods like homemade chocolate chip cookies. I cool these chocolate chips in the fridge because it takes them several hours to cool at room temperature and I just don’t like waiting that long. I’ve read conflicting things about the best temperature to harden chocolate at; some people say that the fridge compromises the flavor and texture. I’ve never noticed this problem with my chocolate, but if you feel like you’re getting subpar results you could try letting them cool at room temperature rather than in the fridge. This recipe makes very dark chocolate chips. If you prefer your chocolate a bit sweeter, I recommend adding more honey. You can taste you chocolate before pouring it into your baking dish to see if it’s sweet enough for you. Add your cocoa powder, honey, vanilla, salt, and tapioca starch. Use an immersion blender to thoroughly mix all ingredients. While you can do this by hand with a whisk, I find the immersion blender is very helpful for thoroughly incorporating the honey and tapioca with the rest of your ingredients. Cool chocolates in the fridge. Once hardened, chop into chocolate chips. Store chocolate chips in a airtight container at room temperature, or in the fridge or freezer for longer-term storage. Many recipes call for 1 cup of chocolate chips. If you measure the cut up chocolate about how much does the recipe make? It makes about 2.5 cups. I don't know why I've never thought about making my own chocolate... I have got to try this. Thank YOU!! These look great! So if you leave out the tapioca for GAPS, do they become a melty puddle when you bake with them? Erin, they don't become a melty puddle, but they definitely melt a lot more than commercial chocolate chips. I was testing them in cookies, and they melted just a *little* bit too much for me. If I couldn't eat the tapioca starch, though, I would probably consider them to be good enough. could i use cornstarch instead? Hi Sera, I haven't tried it, but I assume it would work! Unfortunately my chocolate seized. Can I still use it as chocolate chips? Hi Sera, You know, I've never actually had my chocolate seize so I'm not sure. The texture will definitely be different, but the taste may still be good?